Stowe attended Catharine's Hartford Female Seminary, one of the only schools open to young women at the time. She received an excellent education, and blossomed as a writer under her sister's tutelage. 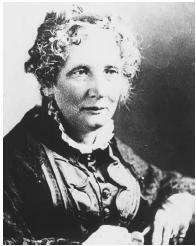 In 1832, she accompanied her sister and father to Cincinnati, Ohio, where Catharine opened another school and their father became president of Lane Theological Seminary. The following year, in 1833, Stowe coauthored and published her first book—a children's geography—under her sister's name. In 1834, Harriet Beecher married widower Calvin Stowe, a poorly paid professor of biblical literature at Lane. During the first seven years of her marriage, Stowe bore five of the seven children they would ultimately have. In order to support their rapidly expanding family, she began writing magazine articles, essays, and other works. In 1843, Stowe published a collection of short stories called The Mayflower. During the 18 years she lived in Cincinnati, Stowe became an observer of the conflicting worlds of abolitionism and Slavery. Across the Ohio River was the slave state of Kentucky. Stowe's family helped to hide runaway slaves. Her husband and brother aided one runaway by transporting her to the next station on the Underground Railroad, the name given to the system of guides and safe houses that enabled escaped Southern slaves to reach freedom and safety in Northern states and Canada. Stowe was engrossed by firsthand accounts and newspaper and magazine articles detailing the horrors of the slave trade and the terrifying incidents that took place as slaves tried to escape. Stowe, Harriet Beecher (1852 or 1853), Onkel Toms Hutte oder Negerleben in den Sklavenstaaten von Amerika, Leipzig, Druck und Verlag Philipp Reclam jun. Stowe, Harriet Beecher (1853), Onkel Toms Hutte oder Negerleben in den Sklavenstaaten von Amerika, Leipzig, Stereotyp /Ausgabe. Stowe, Harriet Beecher (1854), Stryc Tomas aneb Obrazy ze zivota cernych otroku v Americe [Uncle Tom, or Pictures from the Life of Black Slaves in America], transl.